The new LinkedIn Lite Android app has launched in India on Thursday (July 20) which operates as fast and lighter version of the professional network LinkedIn. On the Android operating system, this new LinkedIn lite app offers a seamless and intuitive experience to their users. Totally, this professional network had more than 42 million in India. While this new app for Android users has developed by the Resource and Development team of LinkedIn in Bengaluru. Also, the app is first being released to members in India. However, the company developed this application due to the success of their lightweight mobile website, which rolled out in September month of last year. The company is being on the process of introducing their latest application over 60 countries as soon as one by one shortly. 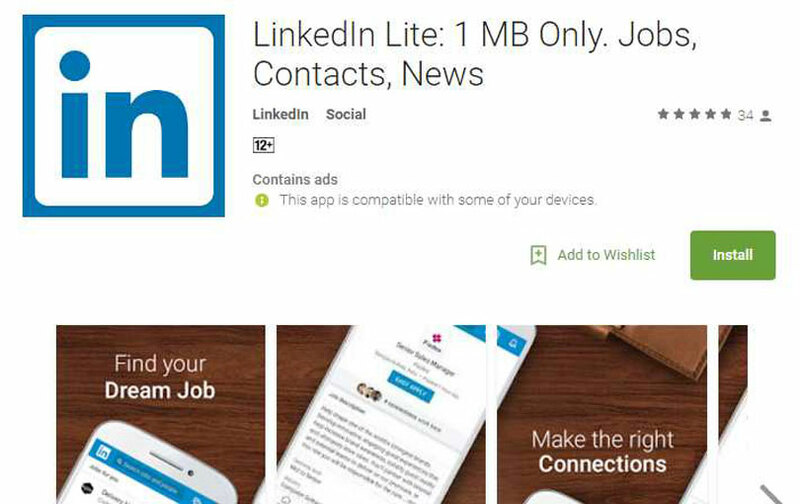 Users can use this LinkedIn Lite without any big requirements of Operating System because the app size is only 1MB. Also, it reduces 80 percent of data usage. So, the users those who all having 2G network can access this app as extremely fast which loads under five seconds. Get this LinkedIn Lite app from the Google Play Store. All the Android users in India can download this application as free. As like the LinkedIn app, it offers the maximum of the features like news feed, jobs, profile, network, messaging, notifications and search. “Besides providing a fast, data-light solution for professionals in slow network areas, we hope the LinkedIn Lite app will democratise access to economic opportunity,” said Akshay Kothari, LinkedIn’s Country Manager for India, in a statement. “Regardless of their device or location, we hope to level the playing field for all LinkedIn members so they can get closer to their dream jobs, grow their networks and become more successful,” he added.